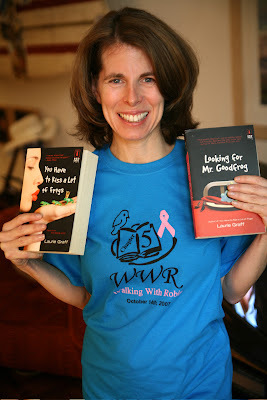 Just Thinking....: WWR shirt on RWR author! A big thank you to author Laurie Graff (Looking For Mr. Goodfrog and You Have To Kiss A Lot Of Frogs) for answering "The Kall" and sending in a photo of herself in the Walk shirt! http://www.lauriegraff.com/ for more info on Laurie and her very clever and funny books! !